Tucson Mechanical Defect or Malfunction Lawyers, Truck Accident Attorney | Russo, Russo & Slania, P.C. If you or someone you love has been injured in a truck accident caused by a mechanical defect or malfunction, contact Russo, Russo & Slania, P.C. today. Commercial truck accidents cause serious damage on Tucson roads. It is important to the safety of motorists, cyclists, and pedestrians that these trucks are designed, built, and maintained properly. If a mechanical defect causes a truck accident, the manufacturers must be held accountable for their negligence. The Tucson mechanical defect or malfunction attorneys of Russo, Russo & Slania, P.C. are dedicated to fighting for the rights of truck accident victims. We work tirelessly to help our clients secure financial compensation after suffering truck accidents caused by mechanical defects. Contact Russo, Russo & Slania, P.C. at (520) 529-1515 to explore your legal options during a free consultation. Commercial trucks, which are some of the largest vehicles on Arizona’s roadways, pose a greater danger than other vehicles. Because of their size, weight, and the heavy cargo they carry, trucks can cause much more serious damage than the average highway vehicle. As a result, injuries in these accidents can be very serious, and the resulting medical bills for your recovery can quickly become unmanageable. If you have been a victim of an injury caused by a mechanical defect, you are entitled to financial compensation after an accident for which you are not at fault. With expenses like medical bills, lost wages, and car repair, it’s important to seek financial compensation as soon as you can. A truck accident lawyer can help you navigate the complicated legalities surrounding mechanical defect cases. Identifying that your accident was caused by a mechanical defect in the first place, as well as determining which part malfunctioned and why, is almost impossible for the average person to do. An attorney can conduct an in-depth investigation of your accident, the truck in question, and the truck maintenance companies and manufacturers in order to determine the cause of your accident and who should be held liable. They can then use this evidence to secure financial compensation from the at fault parties to pay for your many expenses, all while you rest and focus on recovery. Russo, Russo & Slania, P.C. has been helping the Tucson community for over sixty years. In 1956, Russell Russo started his practice in Tucson, and since then, this family firm has since grown to six dedicated attorneys with over 100 combined years of experience in personal injury practice. At Russo, Russo & Slania, P.C., we are dedicated to the people of Tucson and southern Arizona and cherish the trust our community has placed in us. We have a great record of client satisfaction and a 10.0 Superb Avvo rating to reflect that. Over the years, our lawyers have also partnered with local charitable organizations in order to better serve the community. At Russo, Russo & Slania, P.C., we understand the impact of a serious accident caused by a commercial truck, and it is our honor to fight for our clients’ rights. Tire defects – Because of their heavy use, tires on 18-wheelers can wear out quickly and therefore require regular maintenance. If tires are too worn, underinflated, unbalanced, or incorrectly weighed, mounted, or installed, then a driver is more likely to lose control of the vehicle and cause an accident. Brake malfunction – Another vehicle part that sustains regular use, brakes remain the most important deterrent to dangerous accidents. Defective brake pads, lines, pedals, or cylinders can cause brake failure and endanger drivers on the road. Insufficient underride protection – Since commercial trucks are much taller than the average vehicle, trucks must have underride guards to prevent cars from being jammed underneath the front of an 18-wheeler in T-bone and rear collisions. Accidents due to underride malfunctions can be some of the most dangerous to victims. Rear guard failure – Similar to underride protection on the front of a truck, rear guards help prevent vehicles from getting stuck underneath the back of an 18-wheeler. Even if these guards are properly installed and maintained, safety tests have unfortunately indicated that rear guards can break when a vehicle hits it at only 35mph. Headlight, tail light, or sidelight outage – One of the most preventable and easily observed malfunctions with commercial trucks is a light outage. Properly-functioning lights are crucial to safe truck driving. Steering malfunction – Any malfunction of a truck’s power steering pump, tire rods, hydraulic lines, or suspension system could either cause an accident or hinder a truck driver’s ability to avoid one. Engine defect – A malfunctioning engine or transmission could cause serious problems, such as the truck stopping suddenly and/or the driver’s loss of control. Windshield wipers – If a driver cannot see in rainy or snowy conditions because their windshield wipers are not functioning properly, it could cause them to crash. Ignition – A recent case showed that a defective ignition switch can cause a truck to shut down an engine without warning while driving, causing a serious safety risk. There are many early and identifiable signs that these defects can turn dangerous if not taken care of quickly. With large vehicles that are used throughout most of every day, truck drivers are required to regularly service their trucks and pass inspections. If highway patrol discovers a malfunction, they ticket truck drivers, who are then required to report the needed repairs to their employer. However, since these necessary repairs can take time out of driver routes and schedules, they can sometimes be overlooked. This irresponsible decision can lead to disastrous consequences. Some of the most serious injuries and deaths on Arizona roads are caused by 18-wheeler accidents. You should not have to suffer after experiencing a serious injury in such an accident, especially when a truck’s mechanical defect was the cause. Medical expenses can quickly pile up for serious injuries after accidents like this, not to mention your emotional suffering and the time off work you may need in order to recover. Seeking compensation in a mechanical defect case will help alleviate your suffering after a serious injury from a truck accident. If you have been injured in a commercial truck accident that was not your fault, but rather the result of a mechanical defect or malfunction, you are entitled to financial compensation. The experienced truck accident attorneys at Russo, Russo & Slania, P.C. are dedicated to fighting for your legal rights and winning the financial compensation to help you cover your physical, emotional, and financial suffering. 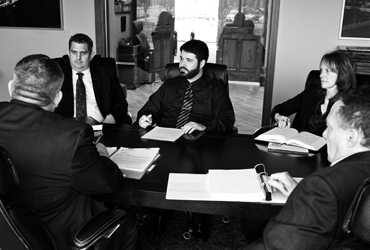 It’s easy to get your case started with a free consultation with our attorneys. Contact us today at (520) 529-1515.